-To provide the funds necessary for Higher Education through an easy affordable scheme. 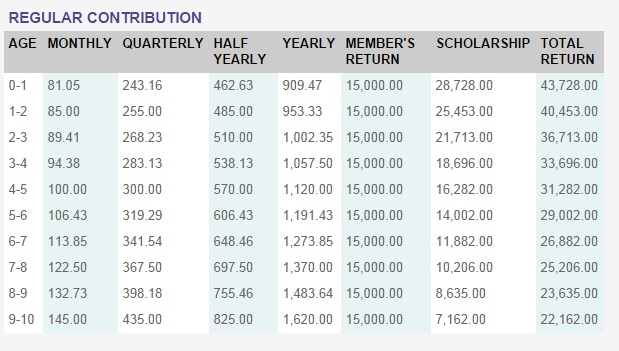 - Koperasi’s are only taxed 5% and can only give a maximum 5% dividend to its shareholders (Cooperative Society Act 1993), thus maximizing the profit earned from its investment. - Whereas Insurance companies / Takaful Operators are taxed 8% + a 25% corporate tax by the government. They also need to give out a higher dividend to its shareholders based on the profit earned. -All Contributions up to time OF DEATH or TOTAL DISABILITY are refunded to surviving parent. -No further contribution towards the fund is required. 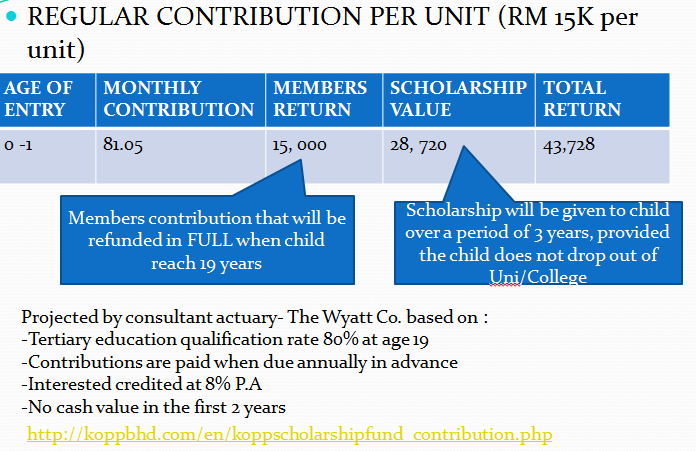 -The child will still receive the Scholarship in the normal manner when he/she continues on to Higher studies. -In the event a member is faced with temporary financial hardship (loss of job/poor business/high medical bills for his immediate family), he can apply for this fund to pay for his contributions for a maximum one year. -Subject to approval of the Board of Directors. -Some students may quit or drop out of College/Uni, or only 2 years courses, the scholarship unused by them is transferred to a fund called the Residual Fund.